The chart below is from a presentation by Frank Romano, professor at the Rochester Institute of Technology. It lists the various applications of industrial printing and dates from 2008. 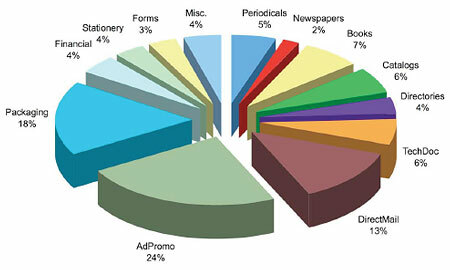 AdPromo, the largest category, includes brochures, flyers, booklets as well as signage and point-of-purchase. The packaging category includes labels, as well as flexible and folding cartons. Printing on corrugated board is also part of the packaging segment. Financial includes annual and quarterly reports. Letterhead, envelopes, business cards and note pads are examples of stationery. The forms category includes not just carbon, carbon-less and multi-part forms but also internal documents such as reports and handouts. More exotic printed products are grouped in the miscellaneous category. This includes wall paper, wrapping paper, greeting cards, calendars and posters. Periodicals include magazines, journals and newsletters. Newspapers are typically dailies or weeklies. The books segment contains mass market bound and paperback books as well as professional publication and college & university press. Catalogs are printed for both the consumer and business market. The best-know type of directories are the white and yellow pages. They dwarf the market for trade and organizational directories. The technical documents category includes manuals, guides and instructions. Direct mail consists of post cards, self-mailers, booklets and letter mail.